Gov. Dannel P. Malloy signs the executive order under which he will run state government in the absence of an approved budget. Gov. Dannel P. Malloy struck a conciliatory tone Friday, urging legislative leaders to adopt a new budget even as he signed an executive order to begin managing state finances without one. Yet while he urged legislators to come together he also acknowledged he hasn’t shifted his own fiscal stand much since he proposed his first two-year budget to the General Assembly almost five months ago. 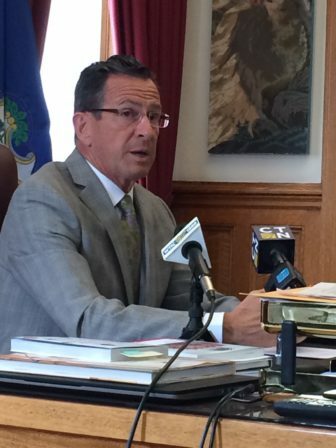 Malloy, who met with reporters in his Capitol office one day before the new fiscal year began, also repeated his warning that social services, aid to towns and most other programs would suffer significantly without a new budget. “This is a regrettable path and one that I worked very hard to avoid,” Malloy said, referring to the three-month provisional budget he asked legislators to adopt this week. This still would have imposed cuts on all areas, but would have approved modest tax hikes to limit those reductions, the administration said. Senate leaders said Thursday they were ready to take up the agreement. But Democrats in the House, who hold a 79-72 edge over Republicans, said they didn’t have enough members present to pass the plan themselves, and Republicans only would support an alternative plan. But while Malloy severely chastised the legislature Thursday, he struck a different chord Friday and urged all legislators to focus on getting him a budget. House Democratic leaders have said they are calling rank-and-file members back to the Capitol on July 18, possibly to vote on a two-year budget — if one has been negotiated — or on a provisional one. But legislators have been gridlocked for months over how to close huge projected deficits. State finances, unless adjusted, are projected to run $2.3 billion in deficit in 2017-18, a shortfall of 12 percent. And the potential gap rises to $2.8 billion or 14 percent in 2018-19. Lawmakers have said they hope to avoid major tax hikes after ordering them in 2011 and 2015, but taxes remain a point of contention, as do proposed cuts to social services and municipal aid, as well as a tentative concessions deal between the governor and state employee union leaders. So when might a budget compromise happen? “When people are capable of putting the greater interests of the state and the greater interests of the citizenry as a whole, as opposed to the individual, ahead of all other concerns,” Malloy responded. So what happens when the governor and legislative leaders each have different definitions of “the greater interests” of Connecticut and its people? Meanwhile, the governor warned that some will suffer during the interim. And none of these extra costs goes down by one penny just because there is no new budget. Further compounding matters, eroding income tax receipts and other General Fund revenues are expected to drop $400 million in the new fiscal year compared with the outgoing one — and revenues in the outgoing year already came in $400 million below expectations.